The central London property market retained its dominance in July, with a 0.5% increase in average prices taking the value of prime property to a new record high. But the pace of growth in prices has slowed in recent months. In fact, July’s 0.5% increase marks the most modest monthly rise in prices since October 2010. So what is causing this slowdown? The focus of the world may have turned to London during the Olympics, but the Eurozone turmoil is still rumbling on with Spain becoming the latest country to feel the pressure. As such, London still remains a key destination for investors looking for ‘safe-haven’ assets, a fact reflected in the continued rise in interest from prospective buyers, up 23% in the three months to July compared to the previous quarter. Rather it is developments closer to home which are preoccupying those in the market, namely the stamp duty rises and proposed property tax changes announced during the Budget in March. There is emerging evidence that the rises in stamp duty are having an impact on the market. And the on-going consultation on the annual charges and Capital Gains Tax which will be levied on property worth £2m+ held in company structures, is creating uncertainty and causing some would-be buyers and sellers to adopt a ‘wait and see’ attitude. The final decision on the consultation will be announced in this year’s pre-Budget report or next year’s Budget. The impact of this market ambivalence can be seen in price movements, with the sub-£2m market performing most strongly over recent months. Activity data, which is another key indicator in the market, shows a slowdown in the three months to the end of July. Total exchanges across the whole PCL market between May and July were 11% lower than the same period in 2011. However, while sales of properties worth between £2m and £10m fell by 23%, exchanges of houses worth £10m or more rose by nearly 30%. July’s snapshot of the prime central London market indicates that activity is starting to recede from record heights seen over the last year or two, to a more moderate pace, indicating that price growth may also slow over the coming months. 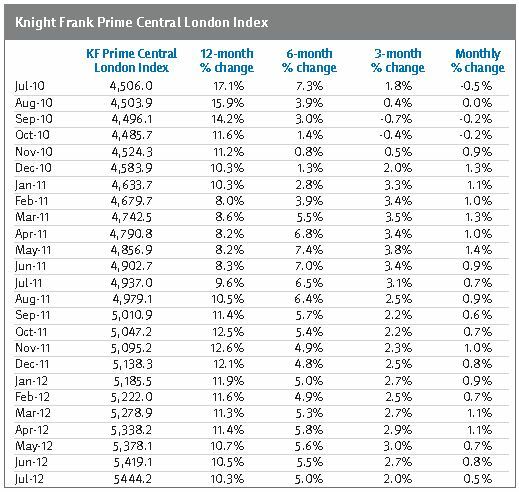 The Knight Frank Prime Central London Index, established in 1976, is the longest running and most comprehensive index covering the prime central London residential marketplace. 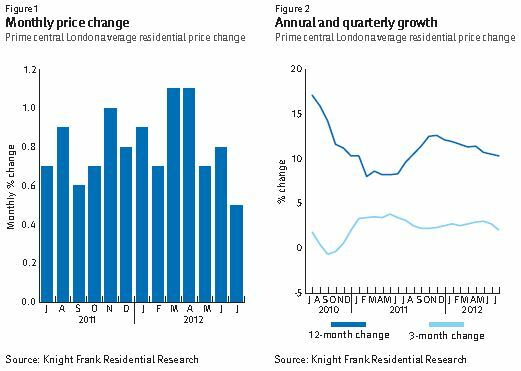 The index is based on a repeat valuation methodology that tracks capital values of prime central London residential property. ‘Prime central London’ is defined in the index as covering: Belgravia, Chelsea, Hyde Park, Kensington, Knightsbridge, Marylebone, Mayfair, Notting Hill, Regent’s Park, St John’s Wood, Riverside* the City and the City Fringe. ‘Prime London’ comprises all areas in prime central London, as well as Canary Wharf, Fulham, Hampstead, Richmond, Wandsworth, Wapping and Wimbledon. * Riverside covers the Thames riverfront from Battersea Bridge in the west running east to include London’s South Bank. The City Fringe encompasses the half-mile fringe surrounding most of the City including Clerkenwell and Farringdon in the west and Shoreditch and Whitechapel in the east.